Apollo was a Phonogram subsidiary operating in the early to mid 1970s primarily as an outlet for Gabriel Omolo and Apollo Komesha, one of the most versatile and popular bands of the period, mixing rumba and benga and singing in Kiswahili, Dholuo and English. Most catalogue numbers have been shortened in this discography in the following way: APL 7-685 has been shortened to APL 685, as some sources include the initial 7- and others do not. In addition to their main Apollo catalogue numbers, many singles carry a second number beginning AS, which indicates a connection with Associated Sound (ASL) in Nairobi. 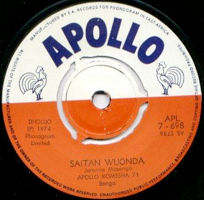 Flemming Harreve in Denmark has pointed out that Apollo was also used as an export label for Polydor releases in Zambia, which carry the same serial numbers as their original Polydor release in Kenya. Clearly there was some crossover with the Zambian market as APL 7-693 and APL 7-694 are in Chibemba, a language of Zambia, though the writing credits for both singles is given as Benson Simbeye, a musician who also recorded in Kiswahili on Equator Sounds.